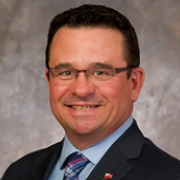 Jeff Wharton was elected as the MLA for Gimli in 2016. He will serve as minister of municipal relations. Wharton is an experienced municipal politician, having been elected as a councillor for the Town of Winnipeg Beach and serving two years as deputy mayor. He and his wife, Mickey, purchased Globe Moving and Storage Ltd., successfully grew the business for over 20 years before selling it in 2010. Wharton continued operating a consulting firm, using his entrepreneurial skills to help others grow their organizations. He has served as president and vice-president of the Lakeside Lions Club, a director on the Evergreen Basic Needs Board, and a director on the Gimli Seniors Residence Board. The Whartons have two daughters and three grandchildren.